Explanation of the Patch generation possibilities. Every Patch consists of one or two Dual-oscillator => Filter => Amplifier paths. A green one and a blue one. These paths are called "Lines". Every item (Oscillator, Filter, Amplifier) in the path has its own envelope generator. So one patch can have up to 6 envelope generators. When you choose to use two Lines in a patch, the second line can be detuned for special effects, you can also let the two Lines modulate each other. This is a screenshot from the Casio CZ iPad app showing one Line. Programming a Patch like this is very easy, compared to the hardware synth button panel. The 2 Lines can be in different configurations, in which they have different effects on each other. One Line: when you select [Line 1] or [Line 2], the Detune or Modulation settings have no effect. This is because for Detune and Modulation you need to use two Lines. Two Lines: when you select [Line 1 + 2'] or [Line 1 + 1'], the second Line in this configuration can be a detuned version of same Line (1'), or of the other Line (2'), the ' stands for "can be Detuned". Detune is "always on", but can be set to zero (no detune). 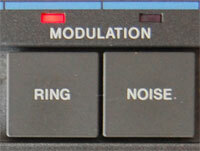 When two Lines are selected, you have access to the different Modulation settings. Fun starts here. Below are the effects of the Detune and Modulation settings for the 2-Line configurations. The amount of Detune can be set quite precisely: from zero (no Detune) to 3 octaves up or down. The amount can be set in octaves, in semi-tones and there's an extra fine tune setting. Again, the Modulation options will only have effect on the [1+2'] selection or the [1+1'] selection. When Detune is set to zero (=no Detune), there will still be a Modulation effect, because both Lines have a small offset (phase difference) to each other. Which is kinda cool. You can not have both RING and NOISE. This setting is where Detune comes in for the emulation of nice analog sounds. - or use Fine detune for a "wave beating" sound effect. When Detune is set to 0, both Lines will sound the same note. - the Detuned Line is always the Carrier. This option is not a modulation in the strict sense, because nothing really is modulated. What happens is, that in this mode the DCO of first Line (always Line 1) is switched to Noise and mixed with the original sound of the other Line (can be Line 2' or Line 1'). 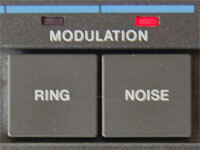 This mode can be used to emulate percussion sounds. - the DCO wave of first Line is replaced by Noise (Key Followed), the filter and the amplifier are unchanged. - the second (Detuned) Line consists of the original wave forms.